For the raw food potluck, I made some beet pasta. How beautiful it is! 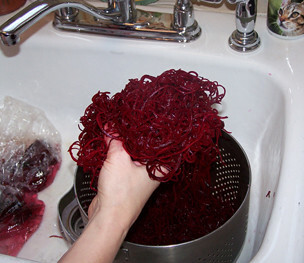 I used a large amount of beets to make a colander full of beet pasta. It was just so pretty that Jim took a picture of it for me. I made a "cream" sauce for it, which turned a really pretty pink color when it was mixed together. I forgot to take a picture of the completed dish, but it was the beet pasta that was so beautiful! 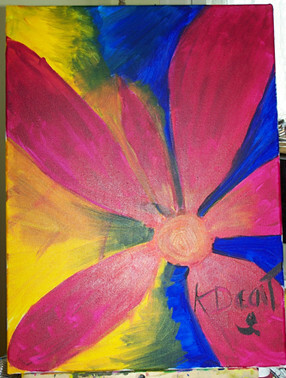 Here's KDcat's painting from Monday. 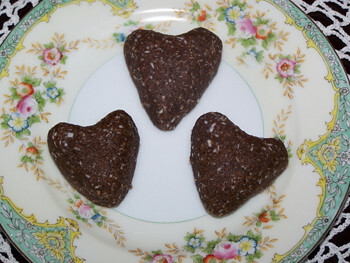 At first she was too shy to share it on the blog, but one of our readers (hi there, Joanna!) asked KDcat to please share it with all of us. This is a painting that was done without any planning. Most of the time KDcat has an idea of what she wants to paint, she sketches things out on the canvas, and then brings her image to life with paints. This time she said she wanted to just paint and see what happened. So, this is different from any other paintings she's done. We love it, of course. She's the resident artist here at Pure Jeevan. KDcat loves that you commented about her painting, Joanna! That was really sweet of you! She giggled when you asked if she'd be sharing more (I'm taking that as a maybe! ).